AAW Symposium this weekend in Pittsburgh! 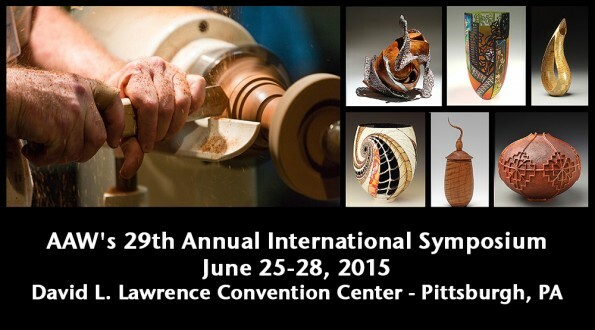 The American Association of Woodturners (AAW), will host its 29th Annual International Symposium, June 25-28, 2015, at the Lawrence Convention Center in Pittsburgh. The conference will bring together more than more than 1,200 turners from around the globe to learn, share, and celebrate the art and craft of woodturning, making it the largest woodturning event in the world. Headlining the public events will be exhibitions and benefit auctions of exquisite sculptural and functional works in wood. Additionally, the community is invited to browse the huge trade show which features ongoing woodturning demonstrations and an Instant Gallery of attendee turned art. A schedule and descriptions of public events follow.